The Queen's Wrath event is live. At the Tower. You'll find that the previously blocked events area behind the Bounty Board is now open. At the far end of the courtyard you'll find the Queen's Emmisary waiting next to her ship. What are available at the vendor? 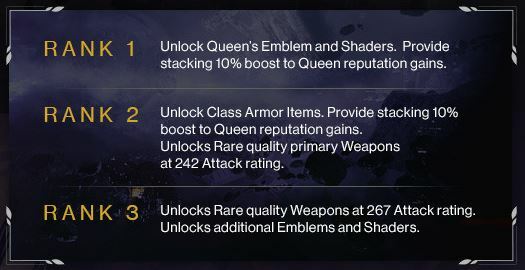 You need to earn ranks via doing the Queen's specific bounties found at the Bounty Board. 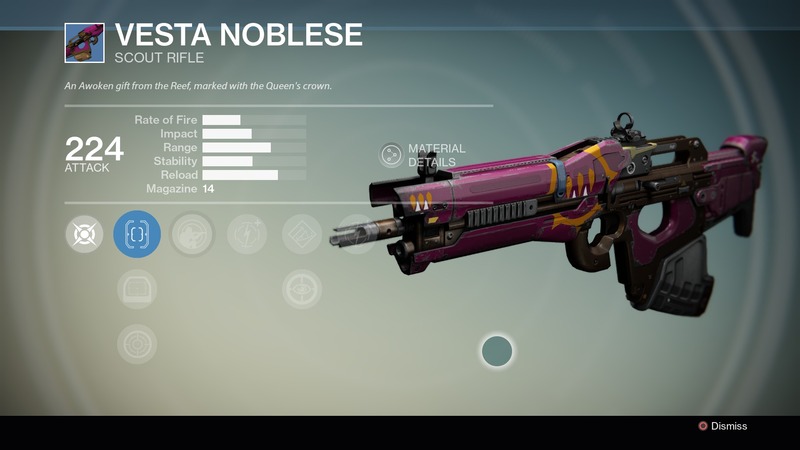 These are in addition to your normal Vanguard and Crucible bounties. There is a timer for a refresh, most likely we will get more the next day. When you select a Queen's Wrath Story Challenge, you are automatically placed into a random Story Mission with the Epic modifier and two random modifiers on it. Example: This morning it was Draksis (which I did three times), then it turned into Black Garden with Void and Juggler (did once). An hour ago it was Restoration (did once). Now it's randomly flipping to something different each time I enter Orbit (it just pulled Black Garden w/Void/Juggler on me again, and now it's Eye of a Gate Lord w/Solar/Juggler). 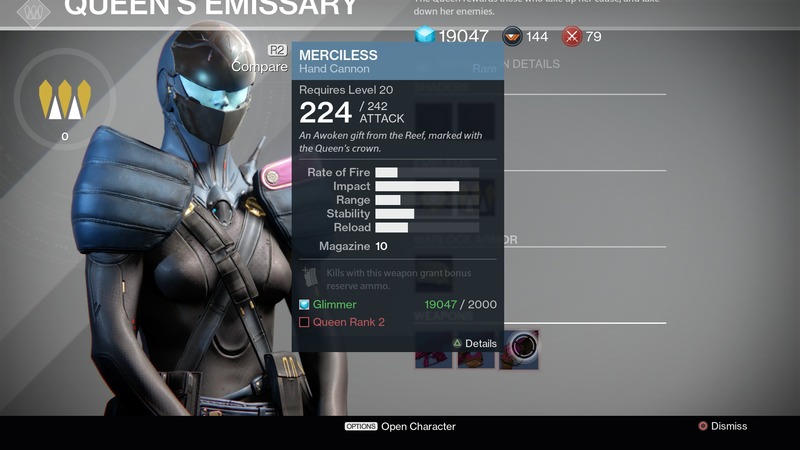 Upon completion of the Story Mission, a Queen's Wrath Mission is removed from your inventory, and you are given rewards (either a Legendary Helmet or Chestpiece, rarely a weapon--I got a rare Sniper Rifle). 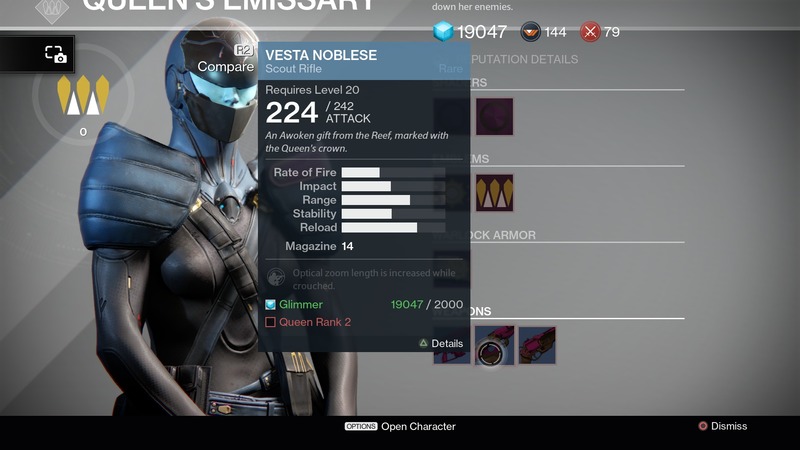 If you have no Queen's Wrath in your inventory, you don't get the rewards. 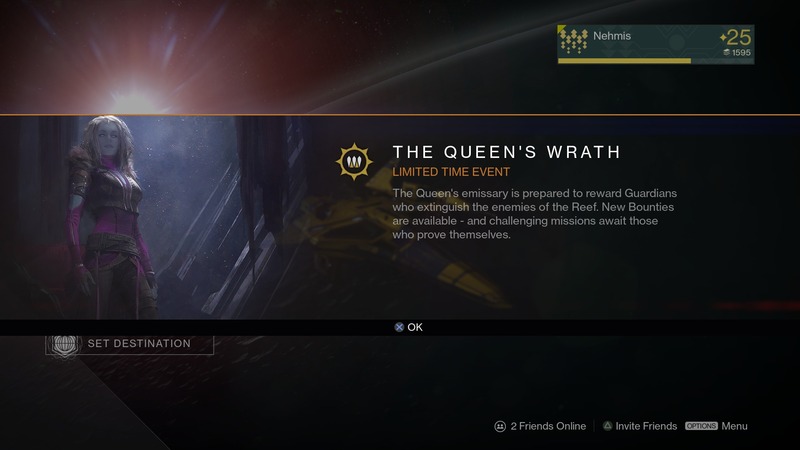 You CAN join someone else's Queen's Wrath Story Mission to help them, but if you do not have a Queen's Wrath in your inventory, you do not get the rewards. If you start a mission and it's a difficult one like the black garden you can orbit and select again and you will get another random mission. As far as I can tell the orders aren't consumed untill mission completion so just keep reloading till you get a mission that is a little easier. 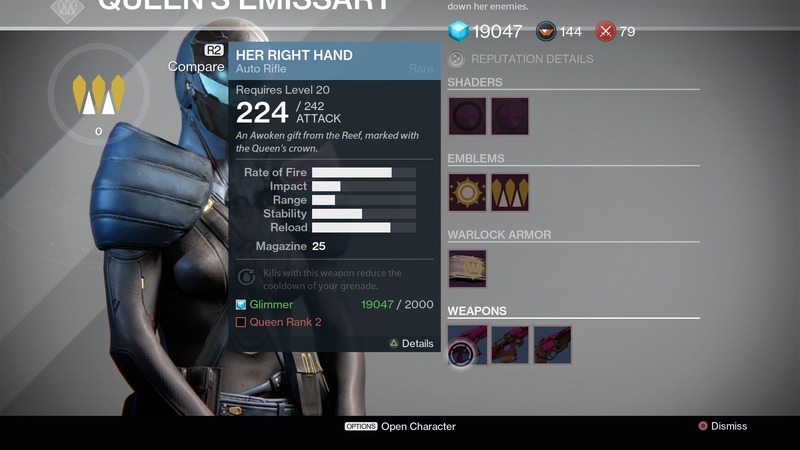 • For Her Honor - Complete 3 Crucible matches with the Queen's Class, Emblem and Shader items equipped. Impossible currently due to not having enough rank to obtain all three. • Warrior of the Reef - Defear 50 Guardians with the Queen's Class, Emblem, and Shader items equipped. • Off with Their Heads - Defeat 15 Guardians with Sniper rifle headshots. • Extermination Protocol - Defeat 200 Fallen with headshots. • Prime Target - Defeat Sepiks Prime, deep within the Cosmodrome on Earth. • Archon Slayer - Defeat Riksis, the Devil Archon in the Cosmodrome on Earth. • By Thy Hand - Defeat 20 Guardians with Hand Cannon headshots. • Face your fears - Defeat 3 Fallen Walkers Must get final blow for it to count unless in a fireteam. 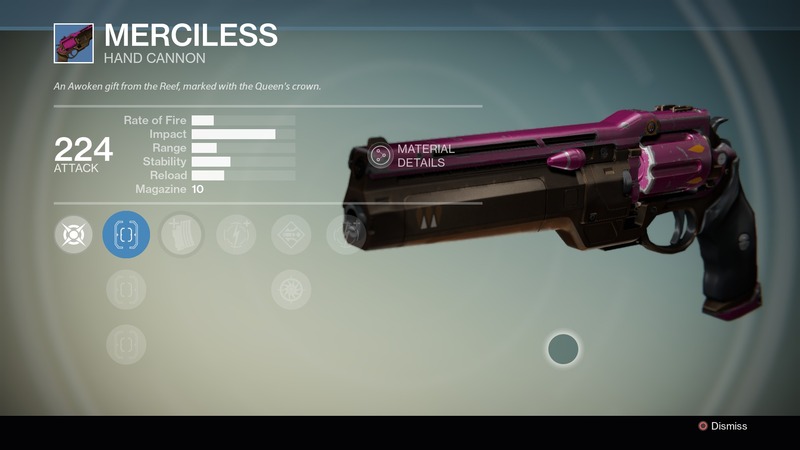 • Her Willful Gaze - Defeat 20 Guardian's with Scout Rifle headshots. 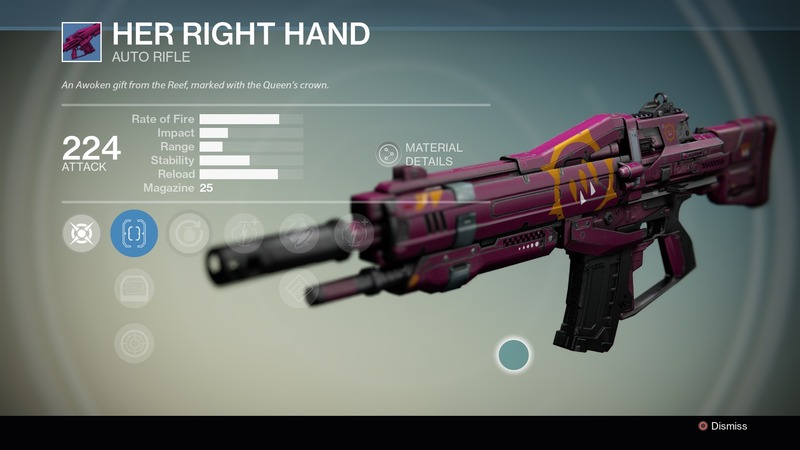 • By Thy Hand - Defeat 20 Guardian's with Hand Cannon headshots. • Relic Harvest - Fallen - Collect 200 Ether Drops from Fallen enemies on any planet. • Archon Slayer - Defeat Riksis, the Devil Archon in the Cosmodrome on Earth. 'Restoration' story mission, the one where you retrieve the NLS drive. • Last Days of Winter - Defeat Draksis, Winter Kell, in the Scourge of Winter on Venus. NOT the Winter's Run strike. It's the story mission.